A lovely review from Jade, although her toddler really isn't that crazy!................ "Lovely company , wonderful with my crazy toddler :) thankyou ! " Debbie hired our tots soft play party package last weekend at Thurlby Church Hall. The kiddie roller coaster was a great hit, and Debbie was really pleased with the cleanliness of the soft play equipment we supplied. "The toddlers loved the soft play, especially the rollercoaster. Would definitely use again. Thank you!" Another fab review, this time from Ann Rivers. Ann booked our ultimate bouncy castle party in Bourne with the princess bouncy castle and added the candy floss cart. Again Ann thought the candy floss cart really gave her party the "wow factor".................... "Great service, very friendly. Everyone especially loved the candy floss. Definitely recommend." Here is our large unisex party themed bouncy castle for hire in Bourne and surrounding areas. This castle is a perfect choice for large events, weddings, parties and fetes. Recently used to the delight of Bourne children at the opening of the new Well head Play Park in Bourne. 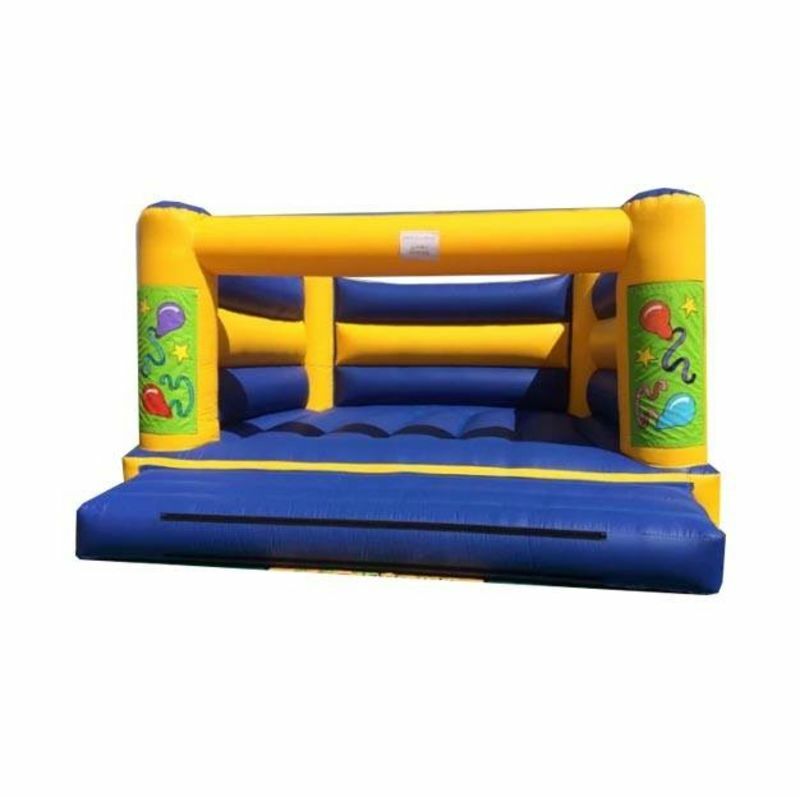 The bouncy castle boasts a massive 16ft square bouncing area meaning it is great for larger parties. We are also getting increasing amounts of bookings for wedding celebrations. Why not add a bouncy castle for your special day to entertain the children and guarantee the adults can also enjoy the event free from nagging children? This particular bouncy caste is unisex party themed meaning that neither boys nor girls will object to its use. It will fit in most good sized village halls locally and is one of our "interchangeable themed" bouncy castle. 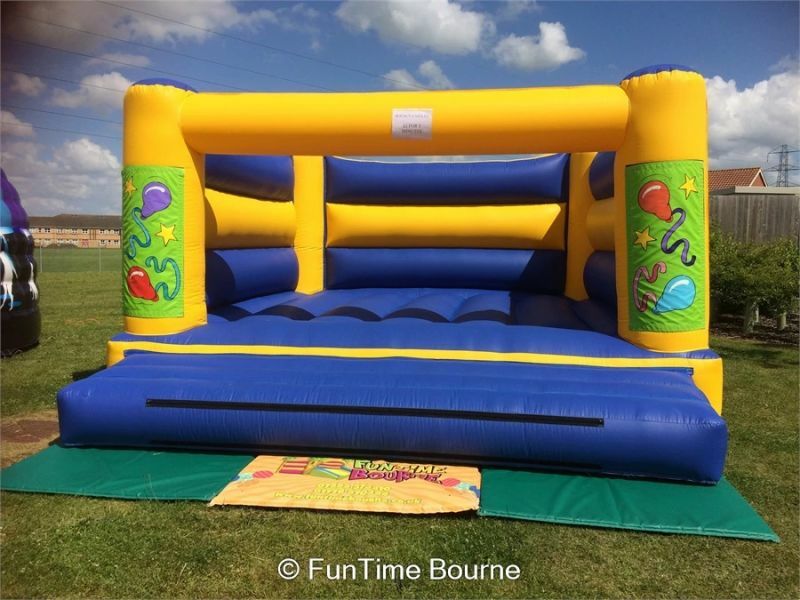 Therefore we do have this bouncy castle to hire in Bourne with Princess, Superheroes or Minions and painted artwork too. If you like the unisex / balloons artwork but don't need a castle quite this large, please take a look at our unisex deluxe bouncy castle hire in Bourne which is also available on our ultimate party package and soft play party packages. Although this bouncy castle does fit in most good sized halls and gardens, please do be sure to measure up prior to booking. If you are creating a childrens birthday party, why not team this bouncy castle with our amazing didi cars (£15 for 4) and a sound system to play party tunes. Alternatively if you are organizing a school / village fete, this castle is extremely popular along side our disco dome and candy floss cart. Should you have any questions about creating your perfect party or public event, please don't hesitate to give us a ring or contact us online.